Please stop being sensible. This is the internet. 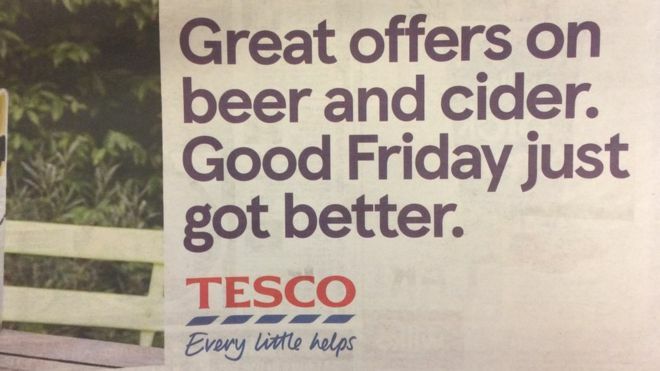 "The reaction of most people, including most Christians, is not “OMG Tescos think cheap cider is better than Jesus’s free gift of eternal life made once for all upon the cross”. They are more likely to think "Oh yes. Guffriday, Good Friday, got better. Very good. Very satirical." And yes, it is a pity that many people do not realize that Good Friday is a sad an solemn day. But the sight of otherwise sane clergymen queuing up to describe the advert as crass, offensive, insensitive, sacrilegious, ignorant and illogical made me think that someone was jumping, rather late, onto a rather ludicrous egg-shaped bandwagon." Not to equate the eating of chocolate eggs and the buying of cheap beer with slavery, but isn't this a similar kind of handwaving of 'people I don't agree with' displayed by your 'green inkers' (whatever that means) to the renaming of Colston Hall? "Most people just think 'Oh yes, Colst'nall, that big place over there where they play music.'" "It's a pity there are unfortunate implications, but..." "This minority of lunatics coming out of the woodwork to complain about nothing, not like true Christolians." You're almost missing a chance to say 'political correctness gone mad'. Political Correctness is a conspiracy theory according to which the world is being run by Jewish intellectuals in Frankfurt. I would never use the term. I agree that most people do not known who the Colston in Colston Hall is, and have in fact said so several times. I do not think that Colston Street is any more intrinsically connected with slavery than the Waterloo Kebab House is connected with Belgium. And if, in fact, the Green Inkers had said "This is a bit silly. We didn't realize that Colston Hall was named after Edward Colston and neither did anyone else" I would have said that they had an excellent point. Once it has been established that the dividing line is between "We should change the name of the hall" and "We think slavery was OK" then I know which side of the line I am on. I am surprised that wasn't clear from 20,000 words I've already written about this subject. I do not see the analogy with the Easter story at all. Some lunatics MADE UP A LIE that the National Trust had "banned Easter", and lots of people got very cross about it without trying to check the facts. Then, a supermarket REALLY DID put out an advert that was in slightly poor taste, and some clergypeople MASSIVELY OVERREACTED. They knew perfectly well that the advert was not saying "Our beer is superior to the Christian festival of Good Friday"; but they engaged in what I consider to be fake outrage. I think that the reason they did this was that the MADE UP story about the National Trust banning Easter was still fresh in the public minds, and they wanted to exploit it. Some people are shocked by different things -- your Granny might honestly faint and recoil in horror crying "Lawksamercy, a naked man!!!" while you might say "Er...Yes, the fashion in swim wear is slightly less modest this year, isn't it." So I suppose that the Rev. Coles might have been genuinely and sincerely horrified to see the words "Good Friday" being used in a context other than Christian worship (in the same way that some Muslims are genuinely and sincerely upset if a librarian or bookseller handles the Koran roughly.) But it's a pity he tried to draw political conclusions from his reaction.